Notre Dame graduate students Matt Barnes, Andy Deines and Sheina Sim are not your average chefs — really they’re not chefs at all — but they are convinced their studies of invasive species can help you put together both an eco-friendly and appetizing menu for your next tailgate. Inspired by their biology lab’s annual invasive species cookout, which features such specialties as rusty crayfish, Chinese Mystery Snail and earthworms, the group decided to take their rare yet environmentally savvy eating habits public. In January, they launched their website, invasivore.org, which combines invasives research with an innovative yet instinctive solution: “If you can’t beat ’em, eat ’em.” While they educate people on the ecological and economic ramifications of these biological invaders, the food isn’t a bad hook. Working under Notre Dame biology professors David Lodge and Jeffrey Feder with support from ND’s Global Linkages of Biology, Environment and Society (GLOBES) fellowships, the three have encountered invasive species everywhere. Ranging from weedy plants to feral swine, these organisms are known for entering a new habitat and creating an ecological — and often economic — disruption. Destructive, yes. But delicious. Barnes, Deines and Sim have found many ways to turn a nuisance into a nosh. For now, ND’s Invasivores have shied away from the notorious Asian carp and have instead proposed an impressive list of unique dishes using species that are easy to find and prepare. Bite by bite, they may become less of a threat to their adopted habitats. As you prepare your next Notre Dame tailgate, follow these recipes to make an invasivore spread that nourishes the stomach and the mind. Introduced as an ornamental plant because of its fragrant, pretty flowers, the Japanese honeysuckle (Lonicera japonica) has become a nuisance throughout the United States because its creeping vines crowd and choke native vegetation. Its berries are poisonous, but the flowers and their nectar are sweet and can be eaten off the plant or steeped for tea. 4. Garnish with tiny umbrella or something else that looks nice on the rim. Garlic mustard (Alliaria petiolata) is a European relative of cabbage, broccoli and turnips. It can be just as tasty, but the same properties tend to be off-putting to native herbivores, which has contributed to its successful invasion of the Midwest, the East Coast and the Pacific Northwest. Garlic mustard also releases chemicals into the soil that can harm neighboring plant communities. Fortunately, its roots do not grow deep so it can be yanked easily from the ground. Mustards can be tough and fibrous. My first thought was to sauté them in oil, but that didn’t work, so I braised them in chicken broth to soften them a bit. Unfortunately, the garlic flavor and smell was lost in the process. When I make this again, I’ll add some chopped garlic to the sautéed onions. 10. Add remainder of the ingredients (including the braised garlic mustard) individually, making sure each one is well-incorporated. A growing nuisance in the South and Midwest, feral swine (Sus scrofa) are relatives of domestic pigs that escaped or were released as a food source during European colonization. Feral swine damage vegetation by digging and trampling. These aggressive creatures will attack other animals, including livestock, and even people. There is plenty of meat on them, though, and many natural resource managers are encouraging recreational hunters to reduce their populations. 7. Enjoy on a toasted bun. This recipe is intentionally simple to allow the feral pork flavor to come through. Add or even cook in barbecue sauce as desired. 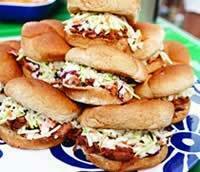 Top the sandwich with coleslaw to enjoy it southern style. The Himalayan blackberry _(Rubus armeniacus)) has Armenian origins but was brought from Germany by botanist Luther Burbank in the late 19th century. Since then, it has spread across half the United States by animals who ingest the berry and deposit the seeds in their feces. The thorny bushes are a pest to hikers and herbivores but they do bear tasty fruit in mid- to late summer. They are best stopped by pulling up the seedlings. 5. Completely cover the custard with fresh and thoroughly washed Himalayan blackberries.